Add character to a plain, inexpensive frame with a border of acorn caps. Hot-glue the acorn caps to the frame. 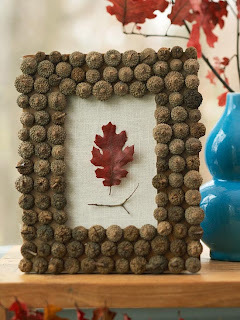 Glue a pressed leaf or other nature find to burlap for a fitting focal point. Candles are the perfect way to create a soft glow that warms up a cool autumn evening. 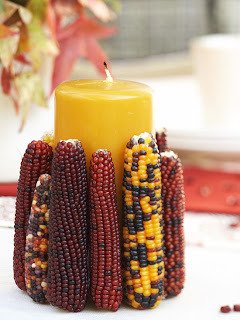 Hot-glue Indian corn to the outside of a pillar candle for a colorful accent. 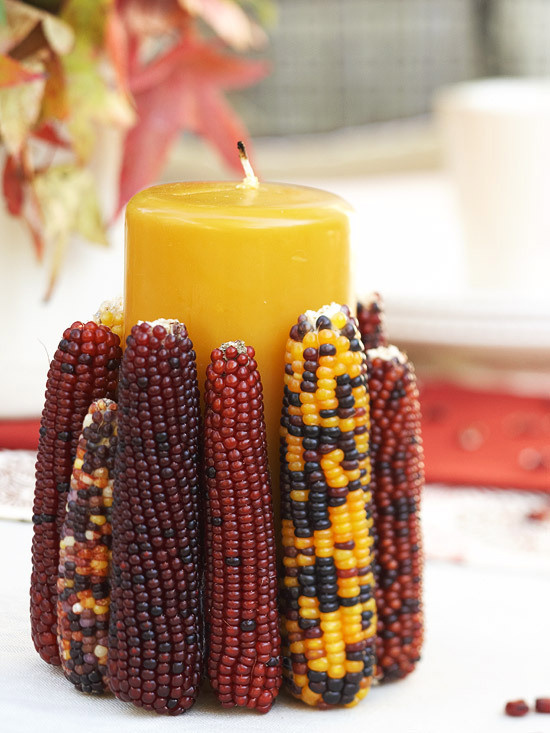 As you burn the candle, make sure the flame doesn't get too close to the corn. 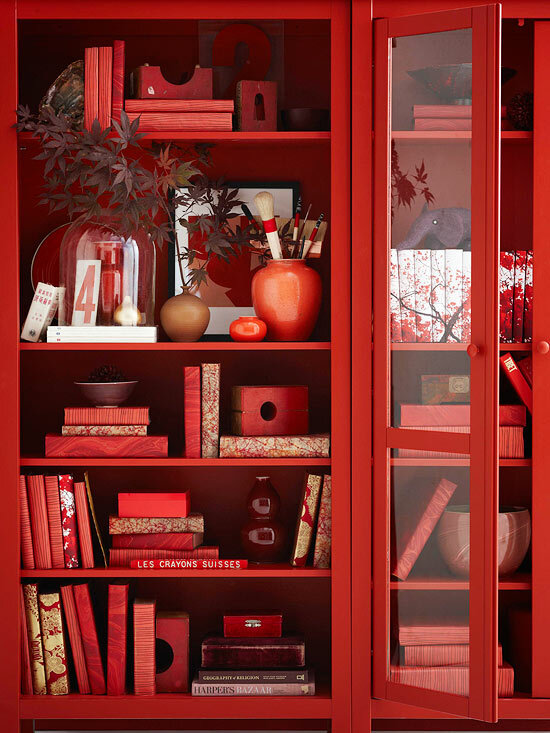 Transform your everyday bookshelf into an autumnal display with a few simple tweaks. First, to create a consistent and graphic look, cover books with festive paper -- we love these tree- and floral-inspired prints. Then incorporate natural elements and accessories in fall hues. Bring a touch of the great outdoors inside with this adorable acorn pillow. 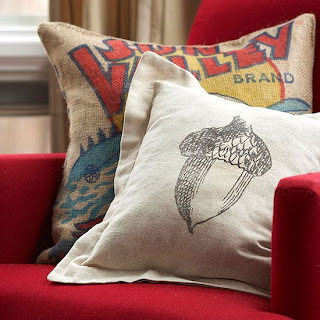 Simply purchase a solid-color pillow in the fabric and color of your choice and a large acorn iron-on. Place the acorn in the center of the pillow, follow the directions included with the iron-on transfer, and you have a festive and fun throw pillow that blends perfectly with other fall decor. Use tissue paper and twigs to make a playful garland. Trace leaf shapes onto heavy cardstock to make templates. 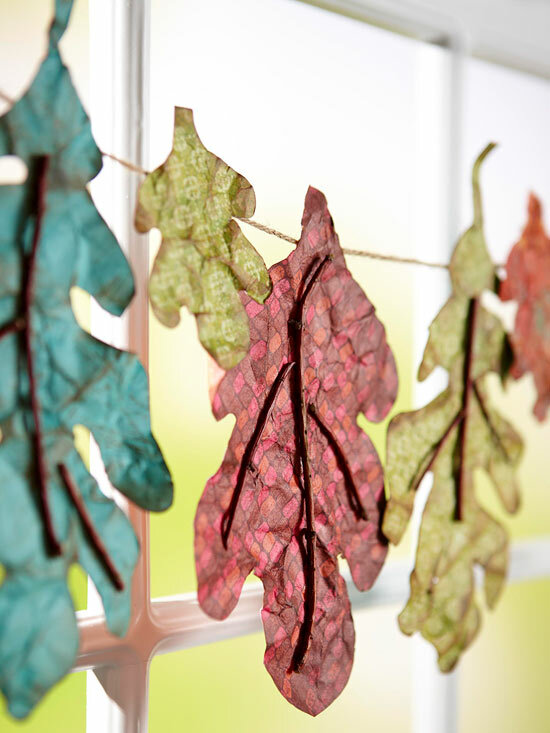 Cut them out and trace the shapes onto tissue paper in the colors of your choice and cut out the leaves. 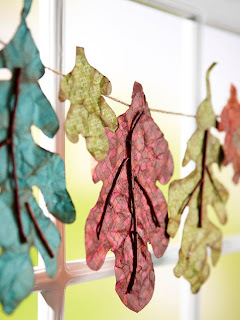 Glue tiny twigs onto the leaves to create veining, then adhere the finished leaves onto a thin strip of twine, and hang the arrangement in front of a window. Fill old jars with fall berries to bring the colors of fall to any shelf in your home. 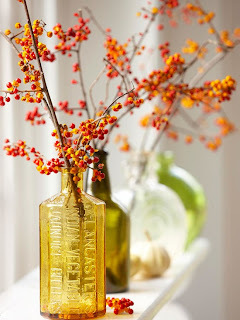 Comb your lawn for fallen branches or snip a collection of twigs off of a nearby tree and place a couple in each jar, scattering a few berry sprays along the surface of the mantel. Tiny white gourds add another dimension of seasonal textures. One of the easiest ways to bring a touch of fall character into your home is through dishware and table linens. 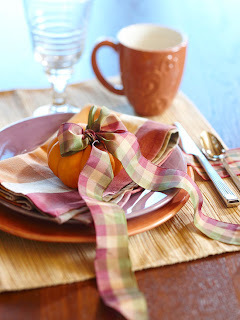 This pretty table setting features fall favorite hues, including pumpkin oranges, maple reds, and straw yellows. A tiny gourd topped with an oversize bow functions as a festive place card. The gingham-print bow and napkin tie together all of the colors and add a splash of seasonal pattern. 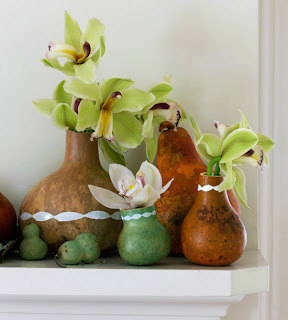 Dried gourds are naturally elegant vases. Group them together on a fireplace mantel and fill with fall flowers for a stunning, organic arrangement. Take a display of mini pumpkin gourds to the next level by adding height. Bowls, cake plates, and candlesticks are perfect for creating an interesting display. 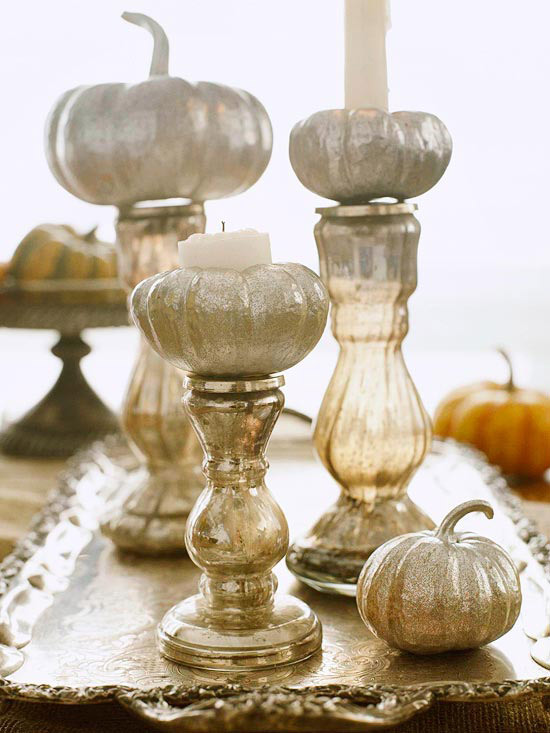 Paint the pumpkins metallic silver for a dramatic effect. 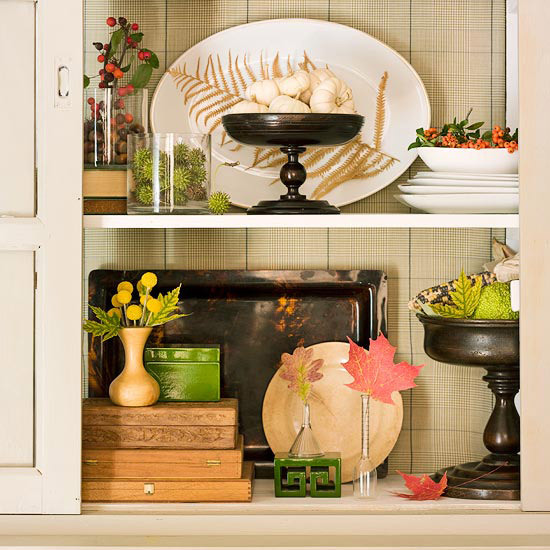 Artfully arrange fall items on a bookshelf or in an open cabinet. Put platters on their sides, fill vases with colorful flowers, and pile bowls with mini gourds to create a diverse display. Try heaping small items, such as acorns, bright berries, and sweet gum seedpods, into glass bowls. Adhere a dried fern frond to a platter with spray adhesive to embellish a simple plate.